Welcome to Smoky Ridge in Pigeon Forge! 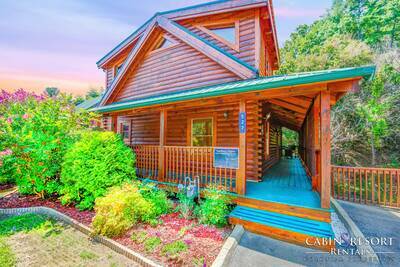 This beautiful, private 4 bedroom, 4 bath cabin rental is an amazing vacation escape. Located at the end of a private dead end paved road and perched atop a beautiful ridgeline, you’ll enjoy the peace and tranquility that surrounds you. 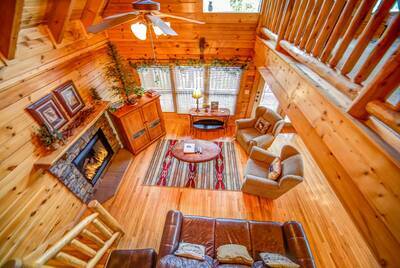 Once you enter this breathtaking cabin, you are greeted by exceptional furnishings and fantastic amenities. The comfortable living room provides you with ample seating, gas log fireplace, large flat screen TV, deck access and so much more! Adjoining the living room is the large fully equipped kitchen. Here you can prepare, cook and serve a tasty meal for your family and friends, all from the comforts of your Pigeon Forge cabin rental. Located nearby is also the private dining area. Here you can grab a seat with your loved ones and enjoy one another’s company. 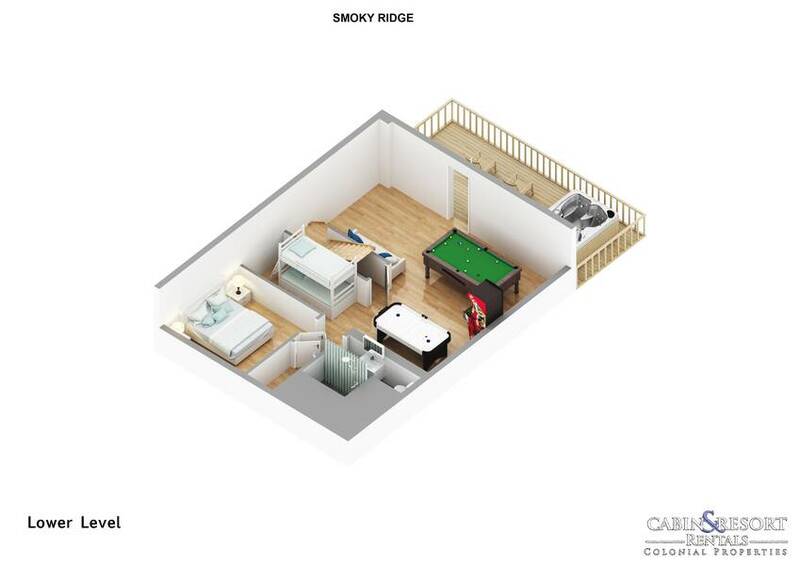 On the main level of Smoky Ridge you will find a relaxing queen suite bedroom. This bedroom offers a flat screen TV, custom crafted log bed and access to the adjoining full bath. 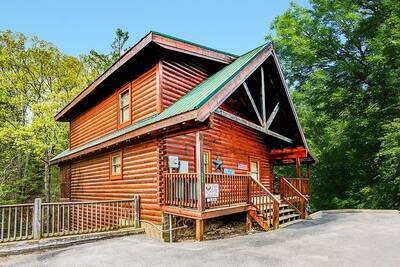 Venture down to the lower level of this stunning Smoky Mountain cabin and enter an area of fun and excitement. Here, you and your guests can spend time playing pool, air hockey, a game on the arcade, or kicking back and watching your favorite movie or sporting event on the projection screen - complete with state of the art surround sound. On the lower level of Smoky Ridge is also a children’s bunk area, full bath and a king bedroom with custom log bed and flat screen TV. 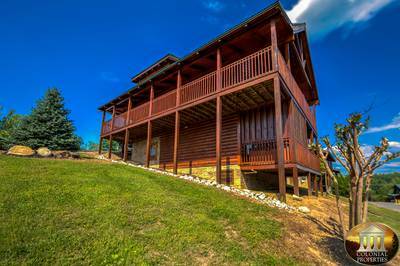 Head upstairs at this Pigeon Forge cabin rental and you will find two additional bedrooms king suite bedrooms, each with private full baths and flat screen TVs. There’s also a foosball table and amazing sunroom located on this floor. The sunroom is surrounded by windows that seemingly frame the breathtaking forest view. In the event that you need to do a little work or just want to browse the internet while on vacation, Smoky Ridge offers complimentary high speed Wi-Fi for you and your guests. If you love being outside, then you’ll love this cabin. The lower level patio features a porch swing and a bubbling outdoor hot tub. 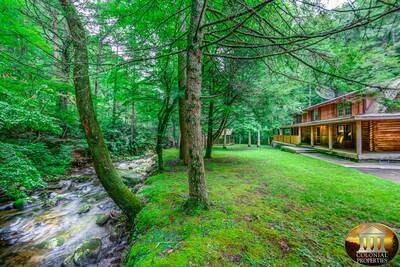 The main level covered deck features rocking chairs, a patio table, BBQ Grill and views of the surrounding forest. There are two entrances into Smoky Ridge, making entry very easy. The front is accessed via steps from the parking area and the rear is accessed via a ramp, with no steps to climb. 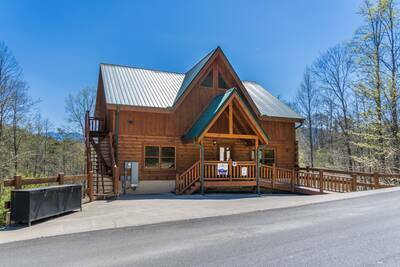 With its private setting, spacious floor plan, exceptional outdoor space and fantastic amenities, your stay at this Smoky Mountain vacation cabin is certain to be a memorable time. 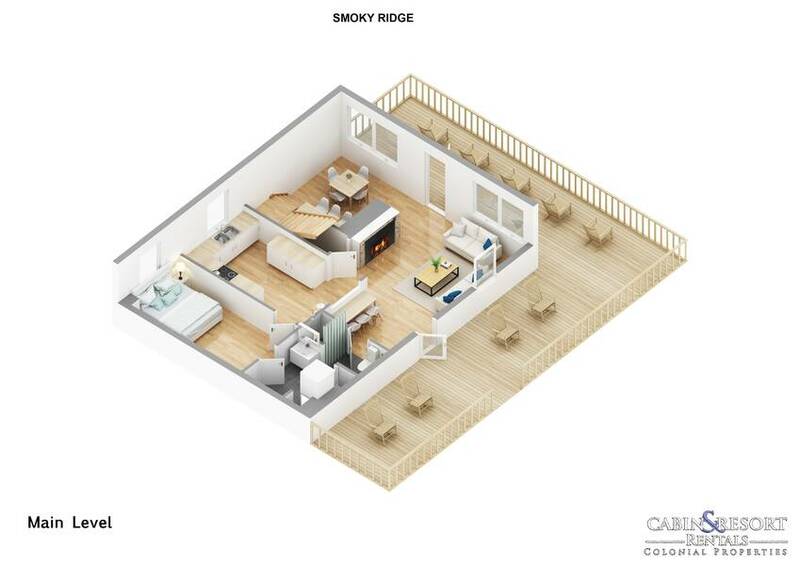 Plan your stay at Smoky Ridge today! Smoky Ridge provides you and your guests complimentary seasonal swimming pool access at Honeysuckle Meadows Pool and Deli! The pool is open from 10AM to 9PM EST daily, weather permitting. When you arrive at the pool, you will need to verify the cabin that you’re staying in. Additionally, there is a catch and release fishing pond located adjacent to the pool. Be sure to bring your fishing pole too! The address to the swimming pool is: 3151 Happy Hollow Road Sevierville, TN 37862 and they can be reached at 865-429-2350. A: Hi Helen! Smoky Ridge is not a pet friendly property. We do have properties on our program that are. A: Hi Amanda! There is no charge to use the games. “ This cabin is just like the pictures and description. It’s a beautiful place to spend your vacation and not want to leave! I highly recommend staying here! “ We had a great time. Definitely worth doing again. “ I was so excited when we went to our cabin. We had looked at the pictures, and read different reviews, and had high expectations. We were not disappointed. Our cabin had ample room for our friends and family ( 3 adults and 6 kids) and the game room was fantastic. The kids stayed entertained the whole time! It was close enough to the attractions, while still giving us the country feel we desired. I will definitely return again! 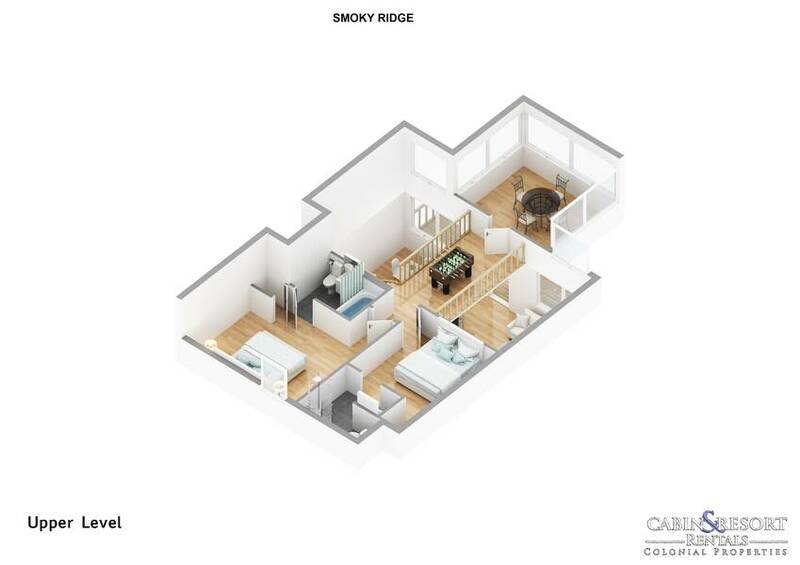 “ The cabin was beautiful inside and out, it have everything you need in a house, the kitchen is complete with everything , bedrooms are very comfortable, the play room pretty.